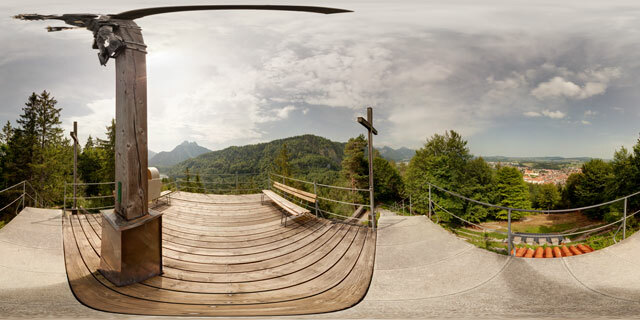 360° VR panorama from the viewing platform at the top of Kalvarienberg, in Füssen, Bavaria. The name ‘Kalvarienberg’ means Calvary Hill, the peak recreates the three crosses from Calvary, with the central crucifix featuring a stylised metal sculpture of the crucified Christ. The viewing platform provides a good view of the surrounding area. To the north-west can be seen the Altstadt (Old town) area of Füssen. To the south-west is Mount Säuling. 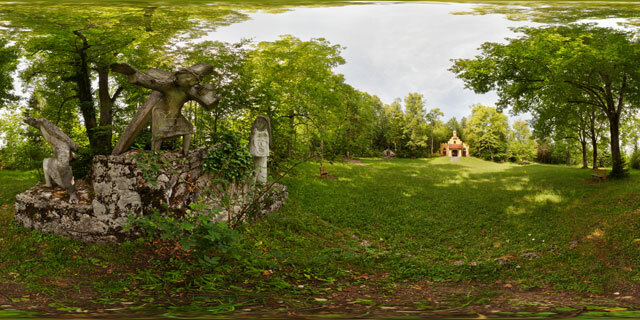 360° VR panorama by a crucifixion scene monument near St. Mary’s Chapel on Kalvarienberg, near Füssen, Bavaria. Kalvarienberg means ‘Calvary Hill’ in English, it features the stations of the cross going up the hill, culminating in a reconstruction of the crucifixion of Christ at the hill’s peak. The Marienkapelle is located in a clearing part way up the mountain, and was built between 1840 and 1842. Across from the chapel is this sculpture of a crucifixion scene showing Christ carrying the cross on the centre pedestal. On the right is a sculpture of Mary with a shroud bearing an imprint of the face of Christ.